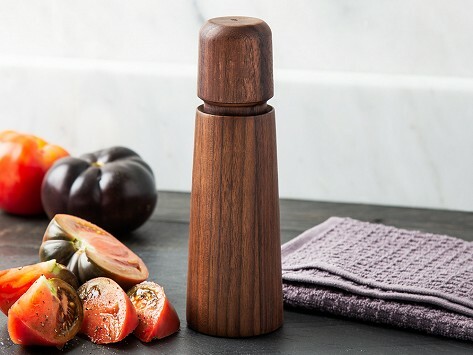 CrushGrind’s pepper mill and salt grinder are longer-lasting and more durable than those with a typical steel grinding mechanism. The ceramic grinder at the foundation of these mills won’t dull with use or corrode with exposure to salt and have adjustable coarseness to suit your taste. Plus, they’re easy to fill. Both mills are made with American wood and ceramic parts that are guaranteed to last 25 years. Beautiful enough to leave out on the counter and works great. Works well. I have two and neither leaves any excess that falls on table. A good clean grind. I bought some black lava salt and needed a good grinder to set on the table. The ceramic grinder works better than my Peugeot pepper mill. Even better the inside well is deep so it needs less frequent refilling.